The Redmond, Wash., company filed documents with the U.S. Securities and Exchange Commission on Monday detailing the review. Reuters pointed out that Ballmer's bonus of $682,500 for the most recent fiscal year matches his target award of his annual salary. But, the compensation is just half of the maximum prescribed. The Board noted in its review of the executive that it took into account the fact that initial sales of Windows Phone 7 had been "lower than expected." Ballmer himself said earlier this year that sales of WP7 devices had gone from "very small to very small." Microsoft directors also considered the 2 percent decline in revenue for the Windows and Windows Live Division had taken place under Ballmer's watch last year. In what has been perceived as a nod to rival Apple's iPad, the Board mentioned "the need for further progress in new form factors" in its review of him. On a more positive note, Ballmer was given credit for successful product launches including Kinect and Office 365, key partnerships with Facebook and Nokia, and overseeing an "overall strong financial year" with record reported revenue and record operating income. Ballmer's total compensation from Microsoft in fiscal 2011 totaled roughly $1.37 million, lower than some of his colleagues because he has declined awards in the form of stock. The company's board notes that Ballmer is "underpaid for his role and performance," while noting that he has a significant stake in the company. 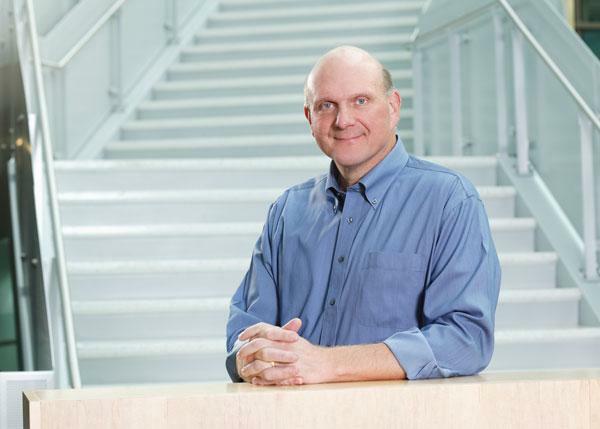 According to Forbes, Ballmer has a net worth $13.9 billion as of September 2011, with the majority of his wealth derived from his stake in Microsoft. The Board's critiques remain similar to comments it made about Ballmer last year. In his 2010 review, they called out "the unsuccessful launch of the Kin phone; loss of market share in the company's mobile phone business; and the need for the company to pursue innovations to take advantage of new form factors" as weak points of his performance. Ballmer was also awarded just 50 percent of his total maximum bonus in 2010. Microsoft's struggles in the mobile space stand in stark contrast to the meteoric rise of long-time competitor Apple's iPhone and iPad. In just a few years, the two devices have grown to become the bulk of the company's revenue. The Windows maker has also struggled with its Zune players meant to challenge Apple's iPad. On Monday, all references to Zune hardware temporarily disappeared from Microsoft's website. The references eventually were re-added to the site, but the company has announced that it will "no longer be producing Zune players."